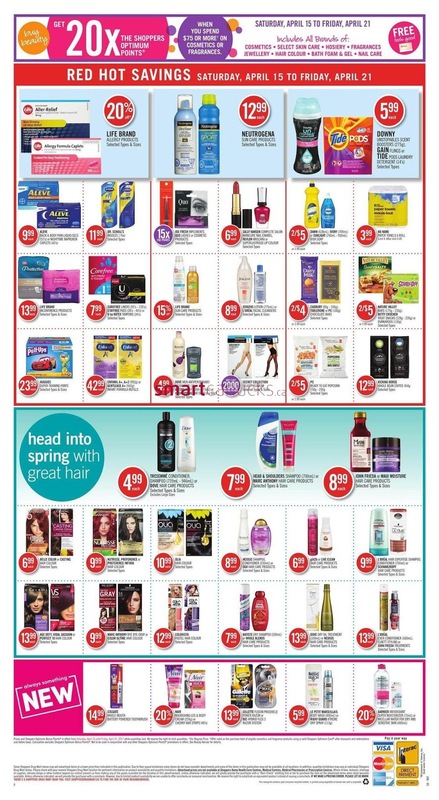 Shoppers Drug Mart Red Hot Savings Flyer April 15 to 21 - Save more from pharmacy shopping this week with Shoppers Drug Mart (ON) Flyer April 15 to 21 featuring your favorite daily meds and cosmetics, select skin care, Hosiery, Fragrances, jewellery, hair colour, bath foam & Gel, nail care. Shoppers Drug Mart (ON) Flyer April 15 to 21 The flyer also contains grocery products and good snacks that are on sale this week. See all prices dropped, mix and match sales, special prices and more on the new Shoppers Drug Mart. Buy beauty get 20 x the shoppers optimum points! On cover page you can see that deal. 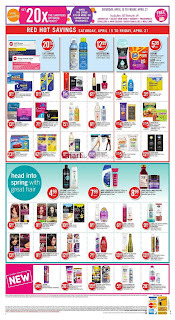 Shoppers Drug Mart flyer valid Saturday, April 15 to friday, April 21. Includes all brands of cosmetics, select skin care, hosiery, fragrances, jewellery, hair colour, bath foam and gel, nail care. Head into spring with great hair, Tresemme contitioner, Dove price 4.99 each, Head & Shoulders shampoo, Marc Anthony hair care products price 7.99 each, John Frieda or Maui Moisture price 8.99 each, Nutrisse, preferene or preference infina hair colour price 9.99 each, Olia price 10.99 each, and more.